﻿Elaine Skeffington﻿ is an experienced vocalist who sings from the heart, covering everything from soulful to sultry. ​Performing in several Seattle-area bands, Elaine is also available as a soloist for special events & other occasions. Wednesday 5/1, 7:30pm - TICKETS ON SALE NOW! What a truly amazing time (9/30/18) at Tula's with Greta Matassa's Big Band Showcase! It's been a bucket-list item of mine for 3 years & last night I stepped onto that stage, backed by an incredible 10-piece band, and got to live it! Thank you Greta, thank you band, and thanks to all the talented vocalists who keep learning & sharing their gifts. ​I love this life! January 2019: HAPPY NEW YEAR! In 2018 I was blessed with an abundance of performance dates and the chance to work with some of the NW's most wonderful musicians. 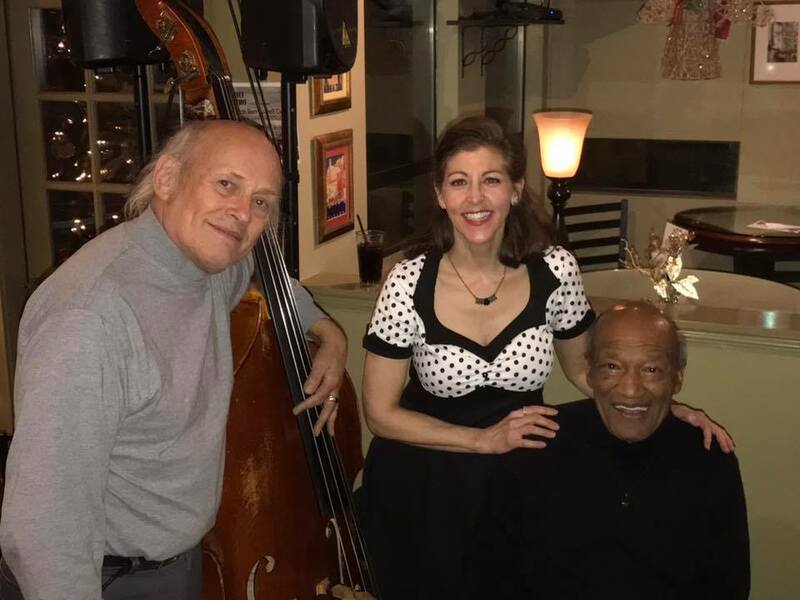 I participated in a "bucket list" workshop, singing with a 10-piece big band on the stage at Tula's, and got to sing with Seattle's own living jazz legend Overton Berry. Compared to many, I got a relatively late start at professionally pursuing my musical dreams, so I'm constantly amazed by and grateful for the many opportunities the years have brought. Here's to all of us following our bliss in 2019, and beyond - remember, it's never too late! Thank you for your continuing support!! September 2018: Wow, it's been a while! Things have been so busy but in the very best of ways. I've been relishing a recurring Jazz gig with fab guitar/bass player Brad Benefield, crooning standards to the Sunday brunch crowd while they (and we!) sip mimosas & Bloody Marys at The Cottage, a truly beautiful venue with an amazing menu & even more wonderful staff. I'm beginning to book a few more Jazz shows and have had some incredible opportunities come my way for future work...what an exciting time! I'm thrilled to be part of an upcoming Greta Matassa workshop showcase (11 vocalists total) singing 3 swinging tunes from the Big Band era, accompanied by Seattle's best Big Band! It's going to be a fun night!! And of course my duo IvyLane is staying busy with lots of shows. Trust when I say I never fail to appreciate how blessed my life is to get to do what I love. April 2018: I'm excited to be booking a number of jazz shows for the first time! This is thrilling stuff for me...I've been singing for quite some time, but jazz is a relatively new focus for my professional music life. No worries - my duo IvyLane is busy as ever and will be around for a long time! But having this other "flavor" to play with is something I've looked forward to for some time. It's never too late to chase a dream! May 2017: With a little more free time on my hands these days (aside from my day job, 2 teens, and a busy working acoustic duo...), I'm enjoying many opportunities to sit in with local bands/musicians, singing everything from Blues to Rock to Jazz. Speaking of Jazz....I'm beyond thrilled (in addition to regular lessons with the amazing Jordyn Day) to finally be studying with Seattle jazz queen Greta Matassa - she has so much to teach & I'm a very willing student. More to come! Jan 2017: I'm jazzed to be re-starting the Thursday SoundCheck at The Scotsman in March 2017! While this year's series will feature fewer "jams" with me & our guest musicians (it will still happen from time to time! ), I will be bringing you an even wider array of amazing local talent! Please join us at The Scotsman at 8pm the *last Thursday of each month* beginning Mar 30! Nov 2016: My acoustic duo IvyLane was once again voted in the Top 20 "Best Local Bands" in the​ Best of Western Washington, this year finishing at #6 thanks to your support!! June 2016: The TROPICS have been hired to be "house band" every Thursday at Angel of the Winds' Watershed Lounge, beginning Sep 8 through the end of the year. Come on out and dance with me & the band! ​PLEASE VISIT & "LIKE" MY FACEBOOK PAGE! Content copyright 2012 ElaineSkeffingtonVocals. All rights reserved.